Lately I have been working on some new aspects to make my BJJ game stronger. Lots of technique. It is making sparring so much fun, trying new things. You really have to put the ego aside when you do that. I had an awesome day hanging out with Brad Cardinal (my personal trainer), we went to sprint hills and run stairs. It was so sunny and nice outside, even though the wind was pushing up back instead of pushing us up the hill. Tonight I met with my wrestling coach because my cauliflower ear needed to be drained again. I am calling him Dr. Ron Bushfield for fun. He has had enough problems with his own ears, he seemed to be the logical choice to drain my ear. I went to the hospital once and waited hours just for them to tell me they wouldn't do it. Ugh, how frustrating. 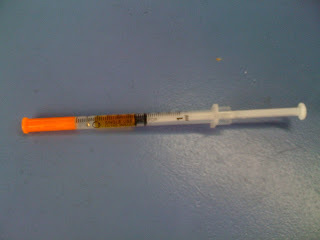 The picture attached is of the liquid he took out. I know, not pretty.